I’m not one to hang on to everything, but there are certain things that have been passed on to me from loved ones that I can’t let go of. Recently, while organizing our storage room, I came across a box of milk glass dinnerware handed down to us from Grandma Shirley. The set isn’t complete, and the pattern is not one that I would typically be drawn to. Yet I could never let it go. Looking at it reminds me of her and how she loved to cook big meals for her family. 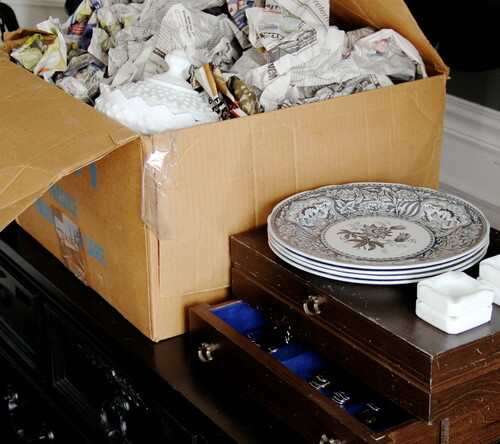 Another box contained a few reproduction transferware dinner plates given to us by my mom. It’s a mismatched set, and it’s not vintage or valuable, but it sparks memories of special times at my parents’ house. After I stumbled on a box of silverware passed down to us from my father-in-law, a lightbulb went off in my head. 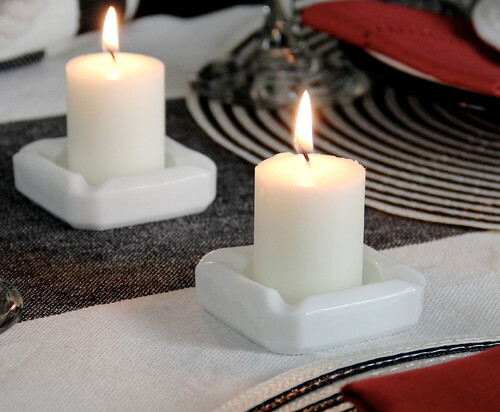 Although these items could be considered misfits on their own, together they form the perfect anchors for a meaningful table setting. The timing for this revelation couldn’t have been more perfect. I was in the middle of preparing for my daughter’s birthday dinner. Our family is adjusting to celebrations without Grandma Shirley and my father-in-law, as they both passed away recently. Using dinnerware that once belonged to them would be a great way to include them in our celebration. Mixing in some of my mom’s plates would represent both sides of our family. My goal was to bring all of these mismatched pieces together in a stylish, festive and youthful way. (After all, it is a teenager we are celebrating.) 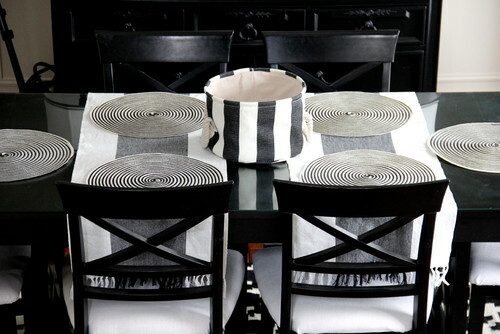 Using Mom’s plates as my color inspiration, I went with a palette of mainly black and white. 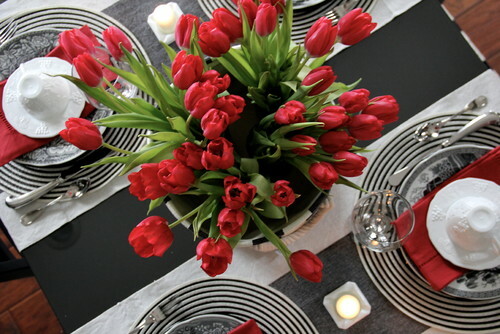 I draped two striped table runners across the middle of the table for a bold backdrop. 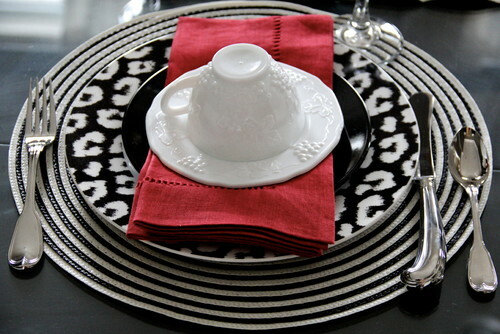 To unify a tablescape composed of mismatched dishes, I used a set of matching black and white placemats. Even though every setting has a different patterned plate, the coordinating placemats anchor the scheme and keep the overall look cohesive. 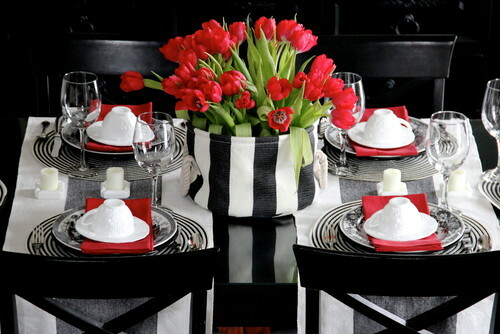 I put together a simple but eye-catching centerpiece by placing fresh tulips in four small vases, which I set inside a striped canvas tote. I had only four dinner plates from Mom and we needed six, so I filled in the blanks with fun patterned dishes I had on hand. I instantly fell in love with the combination of Mom’s pretty, vintage-inspired transferware plates and the bold, contemporary animal-print plates at each table end. 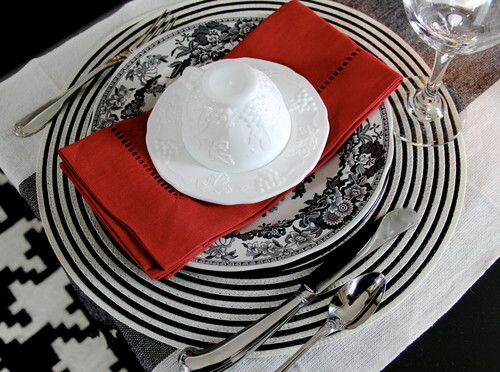 Bright red napkins complement the centerpiece and allow Grandma’s white milk glass to pop against the black and white plates. 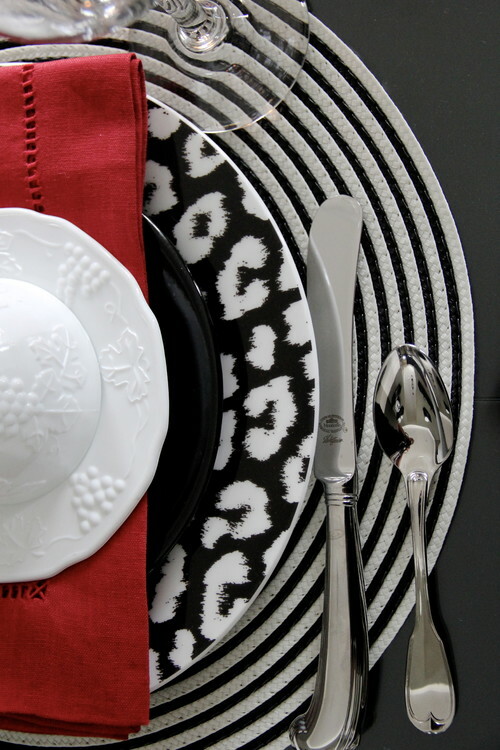 This touch adds to the modern, graphic look of the finished tablescape. Although we won’t be having an after-meal cigarette, we will still enjoy Grandma’s milk glass ashtrays. They make perfect votive holders. Grandma loved coffee and dessert. It seemed poetic that the coffee cups and dessert plates were one of the only items that were complete in the milk glass set. Each place setting received one of her coffee cups, and all six of us will enjoy birthday cake on her dessert plates. When my father-in-law gave me his silverware set, I remember him telling me that he wasn’t sure of the value, but he knew I would enjoy it regardless. We now consider it invaluable. In the end, when the table was completely set, even I had to do a double take. It was hard to believe that this contemporary setting was created using Grannie’s dishes. I am so glad I held on to these items all these years. They hold many family memories. Without them, our birthday dinner table would still have been pretty, but it wouldn’t have had the same meaning.